It appears that April will be a very quiet and productive month for Clay and I – and it is about time! I have been working on a lap quilt and a wall hanging for gifts and so happy to report that they are both waiting to be quilted on the long arm! 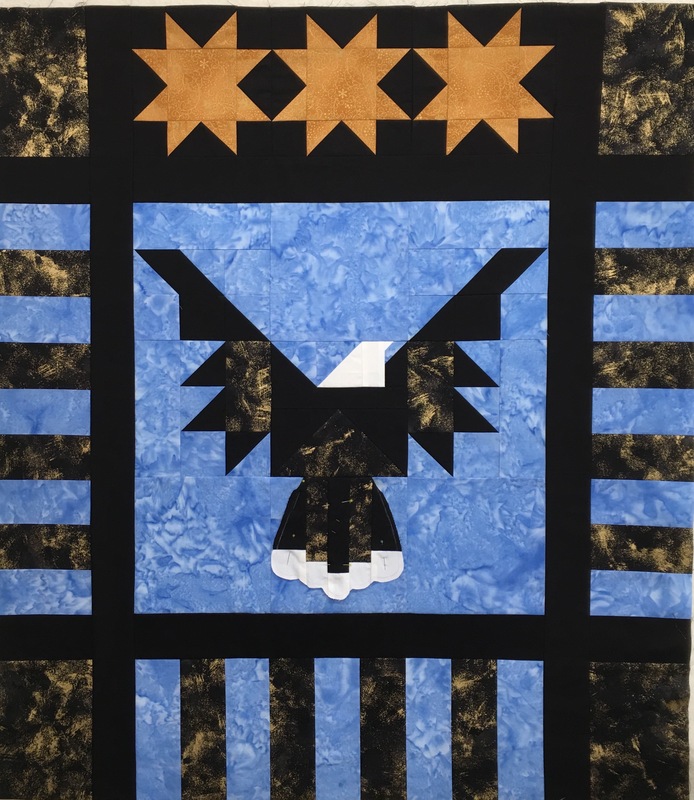 The Eagle quilt is a pattern from Eleanor Burns and this is the 4th one I have made for my Veteran friends. The most difficult piece in this wall hanging is the stupid beak!!!! Each time I have made it I tend to go ‘what?’ and after a few minutes the light bulb clicks in. Guess if I made one a month I could make it with my mind and eyes closed! I had a big laugh on me when I was working on the star points. I love Eleanor’s rulers for Peaky and Spike and especially for Flying Geese, the problem is that I have one of each size and yesterday the brain was getting close to “stupid” and when I started trimming the flying geese I realized something just was not correct! So I threw those pieces away and started over again only to have the same experience. BUT, alas, when one has too many rulers one had better REALLY check which ruler you are supposed to be working with. I just could not believe I was having an issue – so I pulled out the Eleanor Burns bag of rulers and guess what – YUP I had picked up the wrong size. Now here is my excuse for being stupid! The weather was changing and the pressure was dropping like a rock – little did I realize that a cold front was blowing in. I was determined to get the stars finished and I did, but after supper the Vertigo set in and that is when I confirmed to myself it was the weather change. For my Fibro and Meniere’s friends – you know what that means. YUP – go sit in a chair and veg until things settle down. Life is so much fun when you never know what the weather will bring you! Guess it is like the box of chocolates! This morning I finished the borders on the Eagle and that is the end of me for the day. It appears that this will be the weather pattern for the next 2 weeks – so maybe a lot of appliquéing will be accomplished as now we have high winds today! 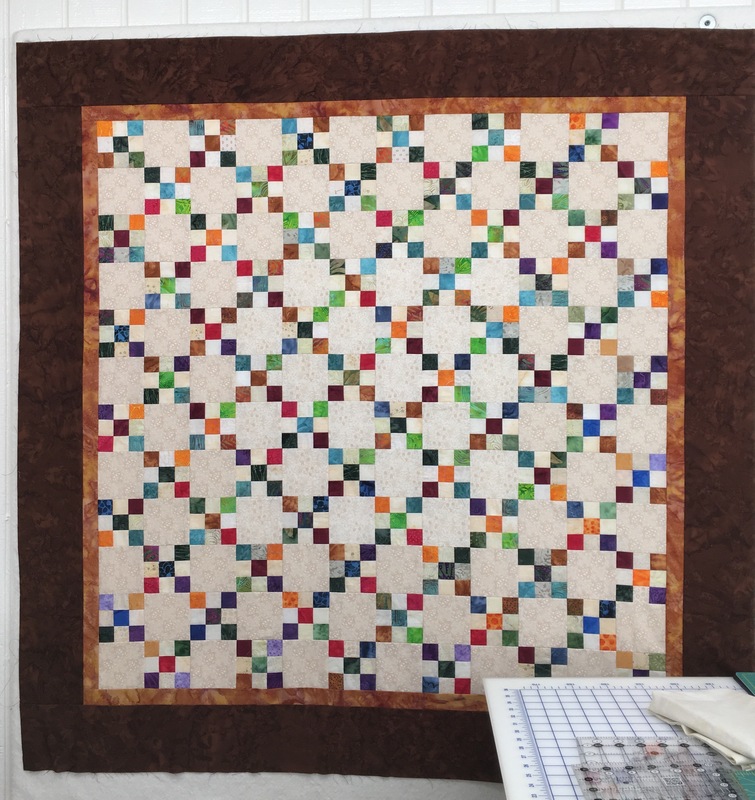 This is the lap quilt that I made last week – so happy to have peace and tranquility and problem free time for quilting! Gretchen is working on a Tulip Quilt. When she first posted the quilt I thought it looked familiar, so I went through my patterns and found it. It is called Tulip Dance by Annette Ornelas. She was a guest speaker in 2008 at a local guild and I purchased her book and some patterns. 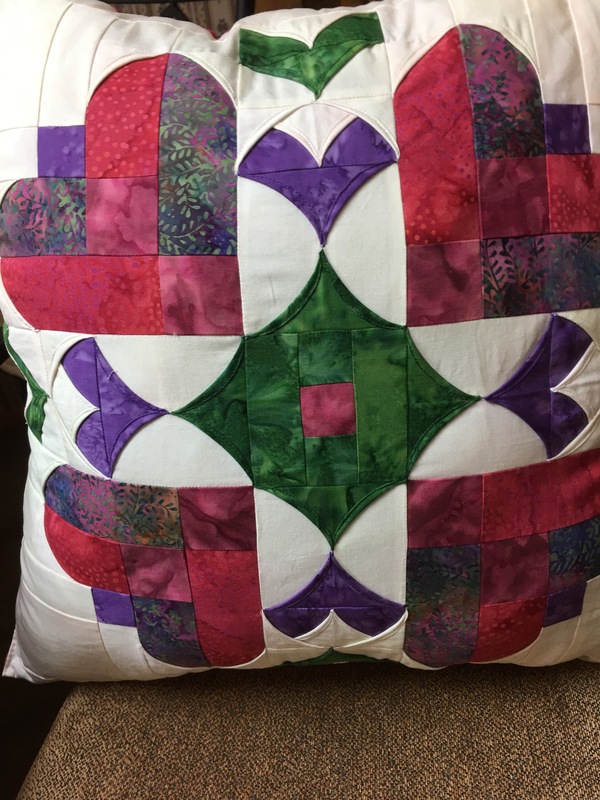 I only did one project, a Heart Block, and made a large pillow cover with it. She has some neat 3 dimensional patterns which are based on a cathedral window type block. I did the appliqué by machine, if I made a quilt I would do the appliqué by hand. Today is done so tomorrow I will get the 2 projects ready for quilting. Have a great day! 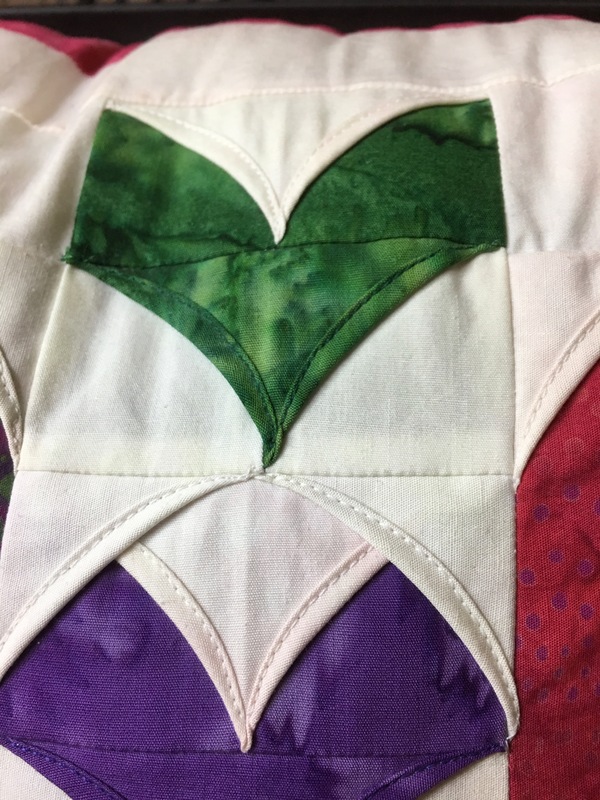 This entry was posted in Quilting and tagged Eleanor Burns, Eleanor Burns Rulers, Gretchen's Little Corner, Southwind Designs, Tulip Dance Pattern. Bookmark the permalink. hope you feel better tomorrow! the weather never seems to do anything with my fibro -guess we are all different! I would like to order a new immune system and body – HUMMM. Better day today! Way to go, 2 flimsies! 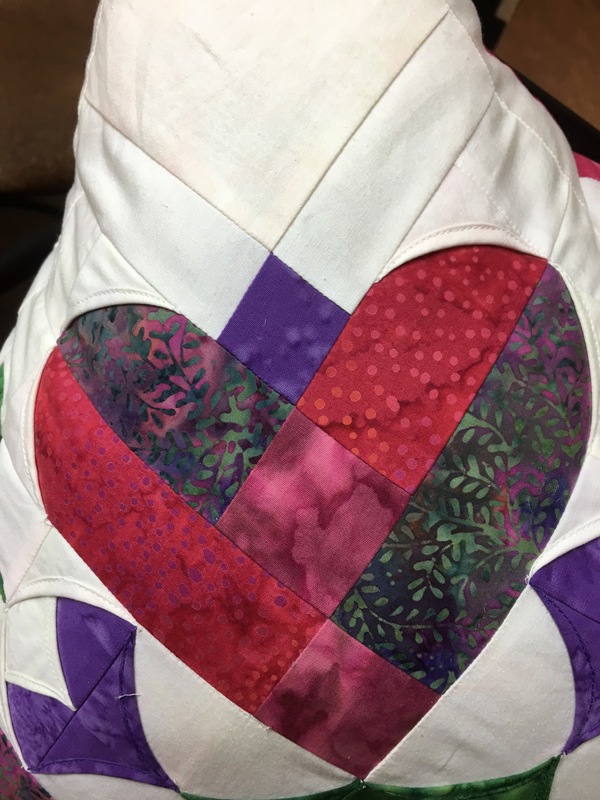 Get them quilted and mailed and you can start that new project you were talking about. Hope you feel better tomorrow. Thx Gretchen. Today is good. I am blessed that I do not have Lupus! It seems this winter (no winter here – only extreme weather changes) has been real hard on me. Be glad when the weather pattern stays more stable. I think I just do not like getting older – as the F and M tend to get worse each year – darn! But am still waking up – that is good! LOL Take care. I am happy too but not too when I lose a day or so. What a most beautiful gift for a veteran. Your cathedral work and hearts are beautiful> Happy Stitching and take it easy. I love the pattern! Thank you on the Hearts – Annette really combined the techniques! Takes longer but the outcome can be really worth it! Have a great day! Peddling as fast as I can. Thx for the comment.